Sometime around 1992 my father returned from a business trip to Germany bearing an unusual pyramid-shaped puzzle created by Ernő Rubik, the famed creator of the Rubik’s Cube. I lost the thing at some point. Over the years, I’ve occasionally tried to find one to no avail… until I found one at this year’s Toy Fair. The vendor thought it was a brand new puzzle and was pretty bewildered when I picked it up, took it apart, and swiftly reassembled it. Throughout this she insisted that there was no way that I had ever seen this particular puzzle before. The 4-colored pyramid has approximately the same solution as a Rubik’s Cube: one solid color per side. The primary difference in the Rubik’s Triamid is that instead of twisting, it breaks apart and the goal is to rebuild it. It consists of 10 colored cubes and 4 black connector pieces. These pieces snap together in a manner that is particularly satisfying. I solved the thing when I was 7 or so and it took some doing. Decades later I still remembered the key trick to it. At this point, I cannot objectively tell you if it’s tough. However, I do find its functionality and elegant solution satisfying. Update: The geometry of this thing is more interesting than I realized and there is a more complex way of solving it. 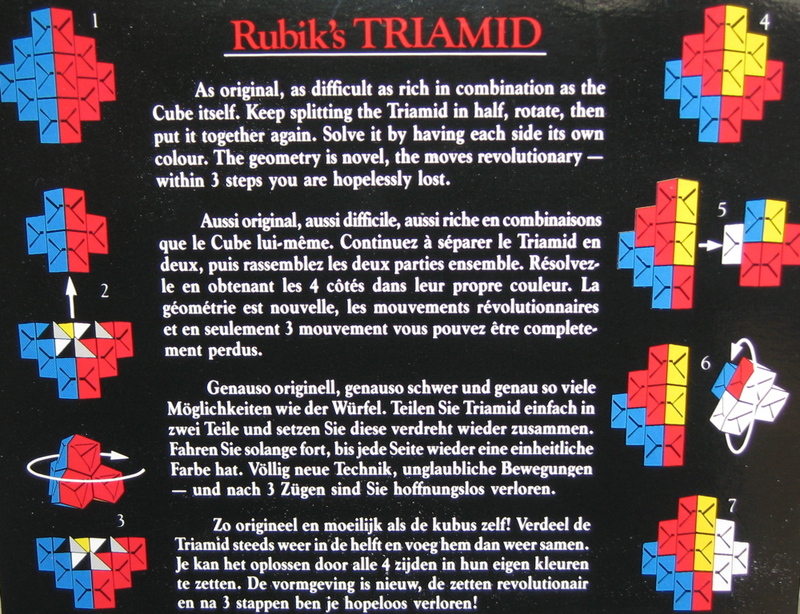 Get yourself a Rubik’s Triamid and relive one of my favorite childhood puzzling memories.